Opportunity's view after maneuvering out of sandtrap. Engineers and mission managers for NASA's Mars Exploration Rover mission cheered when images from the Martian surface confirmed Opportunity had successfully escaped from a sand trap. From about 174 million kilometers away (about 108 million miles), the rover team at NASA's Jet Propulsion Laboratory, Pasadena, Calif., had worked diligently for nearly five weeks to extricate the rover. The long-distance roadside assistance was a painstaking operation to free all six wheels of the rover, which were mired up to their rims in the soft sand of a small martian dune. "After a nerve-wracking month of hard work, the rover team is both elated and relieved to finally see our wheels sitting on top of the sand instead of half buried in it," said Jeffrey Biesiadecki, a JPL rover mobility engineer. 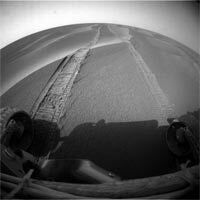 Traction was difficult in the ripple-shaped dune of windblown dust and sand that Opportunity drove into on April 26. In the weeks following, the rover churned 192 meters (629 feet) worth of wheel rotations before gaining enough traction to actually move one meter (about three feet). The rover team directed the drives in cautious increments from May 13 through June 4. "We did careful testing for how to get Opportunity out of the sand. Then we patiently followed the strategy developed from the testing, monitoring every step of the way," Biesiadecki said. "We hope to have Opportunity busy with a full schedule of scientific exploration again shortly." Opportunity's next task is to examine the site to provide a better understanding of what makes that ripple different from the dozens of similar ones the rover easily crossed. "After we analyze this area, we'll be able to plan safer driving in the terrain ahead," said JPL's Jim Erickson, rover project manager. Both Spirit and Opportunity have worked in harsh martian conditions much longer than anticipated. They have been studying geology on opposite sides of Mars for more than a year of extended missions since successfully completing their three-month primary missions in April 2004. "The first thing we're going to do is simply take a hard look at the stuff we were stuck in," said Dr. Steve Squyres of Cornell University, Ithaca, N.Y. He is the principal investigator for the Mars rovers' science instruments. "After that, we will begin a cautious set of moves to get us on our way southward again. South is where we think the best science is, so that's still where we want to go." Shortly after landing in January 2004, Opportunity found layered bedrock that bore geological evidence for a shallow ancient sea. Spirit did not find extensive layered bedrock until more than a year later, after driving more than two miles and climbing into a range of hills known as "Columbia Hills."